This weeks fishing reports have been outstanding. The weather has been nothing short of fabulous and some great catches have ensued. 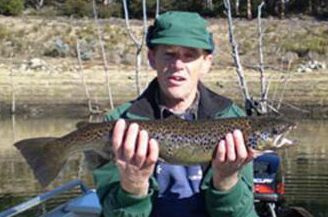 The Thredbo and Eucumbene rivers have been fishing well for both resident and spawning fish with a few still being caught on dry flies. Glow bugs and nymph have taken some Monster browns too. Baitfishing and Trolling have brought home plenty of nice ones too. Rivers:- Fishing has been great in the rivers. 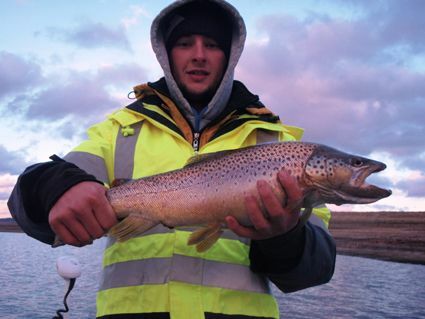 Several anglers have reported some good hatches and fishing with dries during the day. Beetle patterns, Adams and Cowdungs have been good on some of the smaller to medium streams like the Gungarlin and Murrumbidgee. 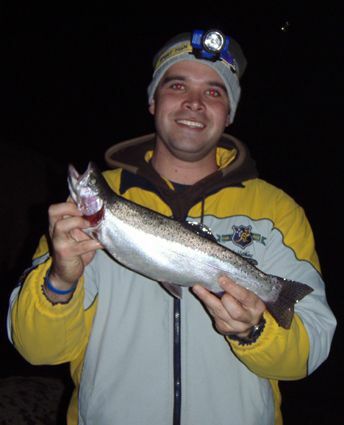 There is some great Glo bug fishing to be had and overnight rainfalls have seen a few more fish in the Thredbo and Eucumbene. Glo Bugs and Nymphs are the go for this fishing, under a strike indicator. Some of the fish seen and caught have been exceptional. Early starts are a must for these areas and although it can be cold the fishing becomes tougher once the sun is on the water. Flies? Pheasant tails, Hare & Copper, Gold Ribbed Hare's Ear, Black and Brown Nymphs in conjunction with a Glo Bug. Just letting you know that James and I had an excellent session on Sunday 25th on the Thredbo river. James had another one on that made this one look like white bait but unfortunately after breaking the net and going over a rock we lost it. Whoever has the luck to find it will know about it as we reckon he would be pushing above 20 lbs. 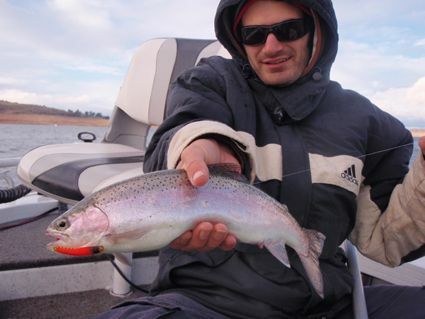 Lake Eucumbene:- Wet flies on dark are producing some fat Rainbows in the lake. Craigs Nightime, Mum's Poodle, Fuzzy Wuzzy, Woolly Buggers are good patterns to try. Homeleigh Bay, Rainbow Pines, Seven Gates and the River Mouth are the best spots to look at. Pick areas with good weed beds and some depth. Searching out clear water is a must as wave action is stirring up some areas and making the water cloudy. 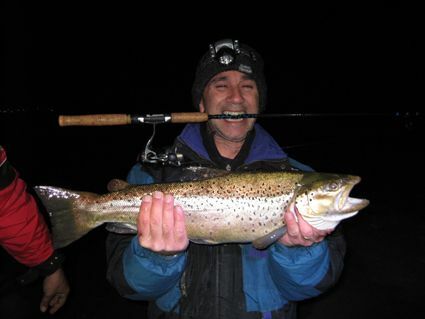 Lake Jindabyne:- The river mouth after dark is a great option for some good Browns this week. 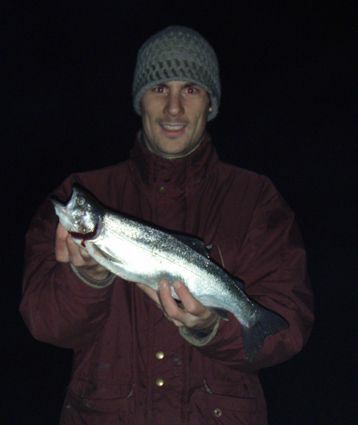 Hatchery and Hayshed bays for some Rainbows, again after dark is a great option. Sinking leaders and lines are the go in the mouth using big size 6 and 4 Woolly Buggers, Fuzzy Wuzzys, Bushy's Horrors, Craigs Nightimes etc. Fish have been coming on late overall so hang around and don't leave too early. Eucumbene:- Reports have been very good over the last week. Leadcore and Downrigging has been the best bet although some anglers are picking up fish on flat lines as well. The Black Hole Alpine Cobra has been taking a few fish this week down deep with the Lime Spider and Green Ghost also accounting for a few fat Rainbows. Tassies in yellow wing patterns are very good, as always. Dual Depths Tassies in pinks and yellow wings have been good. *Tom, Here are a few pics and a report from the Euc during the week. The weather was very inclement during our two days on the water. Aaron Hill, Michael Bowkett, the apprentice and I launched at Old Adamidaby and predominantly fished the main basin and Collingwood bay. We took a number of very fit Rainbows and a few bruising Browns closer to dark. It seemed anything in red did really well during the day and the bigger jointed minnows were a stand out closer to dark. The LureStrike TT minnow, in rainbow trout pattern, was the standout overall, accounting for the majority of the heavy set rainbows. Till next time Tight Lines! Allan Carpenter from Quenbeyan and Ron Kuhna from Wollongong fished Eucumbene Thursday. Trolling was slow with two 40 cm fish on flatlines-however wherever we pulled onto the bank we picked up fish another six on Powerbait, these were better quality all between 46 and 48 cm. We had dinner at the Adaminaby pub where we met 4 gents who had fished for three days without turning a reel. 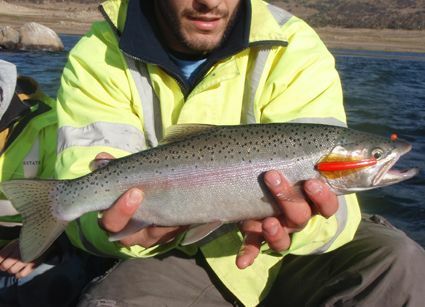 Friday we fished Jindabyne for 9 fish. We landed 3 on the troll before 7am and another six on powerbait through the day The best a well conditioned brown of 50 cm with only one fish under 46 cm. Saturday morning we trolled for an hour with no result, went back to bait from the bank and landed another three within an hour. We were packed up and back on the road by 9 am bagged out! Sorry no pics, although the overall size of the fish were around 3 lb there were no 'trophy' specimens caught. The last two seasons we picked up three memorable browns 68, 78 and 87 cm. 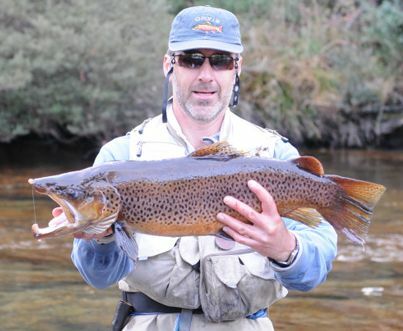 A great report from the Thredbo River maouth and lake below. *22/5/08 - Thursday morning six of us walked the <?xml:namespace prefix = st1 ns = "urn:schemas-microsoft-com:office:smarttags" />Thredbo River from the bridge to the dam. All but one caught about 12 varied sizes fish. One Brook Trout and all the others were Brown Trout ranging in size from 1.5lb to 9.5lb. 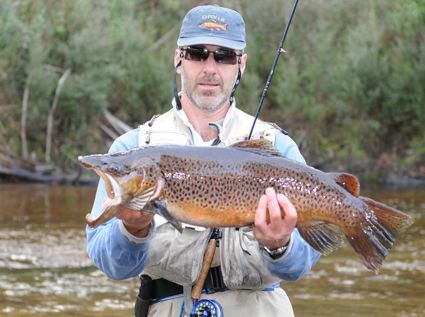 The best catch being a Brown Trout (orange colour) caught by Geoff. Geoff also caught the smaller trout. 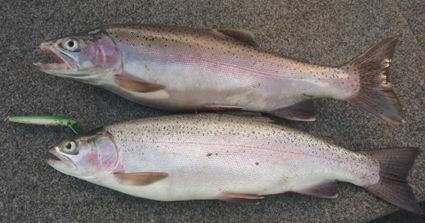 Both fish were caught between 10am and 11am on Squidgie Wriggles 80mm Rainbow Trout pattern. Rebecca caught a nice trout (sorry no picture). All fish were in excellent condition and released back into the river. 24/5/08 - Saturday morning seven of us set out in three boats on Lake Jindabyne and headed to the Snowy and Thredbo arm. 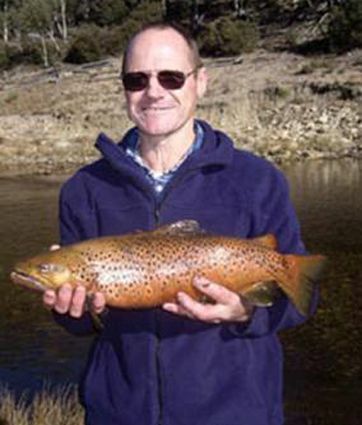 Warren Dutch caught his personal best a nice Brown Trout (female finished spawning) on a minnow in the Thredbo arm before lunch. After a BBQ lunch Wayne caught his fish in the Snowy arm on a minnow. Geoff caught his personal best a Brown Trout 74.5cm, 9.5lb (male) trolling a Squdgie Fish 60mm Rainbow Trout pattern in about 6 metres of water. It jumped about 5 times and had a couple of good runs. We had great weather and a great time, only two people didn't catch any fish but they enjoyed each day on the lake. We are looking forward to our trip next year. *Matt Perdrau and Ben Munstermann had a great session spinning with Rapalas around the lake edges. They landed eight fish to 3kg. CD Fives and Sevens were the best lures. Went up to Jindy last weekend with a few of the blokes, between us caught seven trout. Three of them were caught trolling with tassies, the others were hooked up off the bank at night. 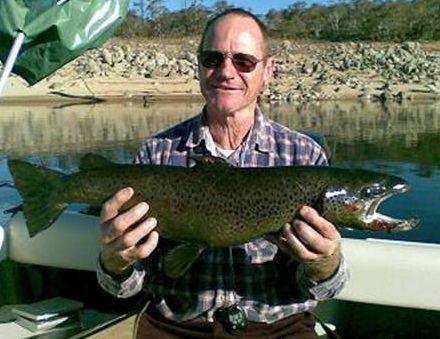 Rainbow power bait was the big hit as Angelo Bouzas found when he caught this nice 2.5 kg brown trout, his first trout landed after two years of trying. well done angelo. Baitfishing :- Mudeyes are still in supply this week but and are taking some nice fish. Powerbait and Scrubworms hae been good and Grubs, if you can get them, are well worth using too. 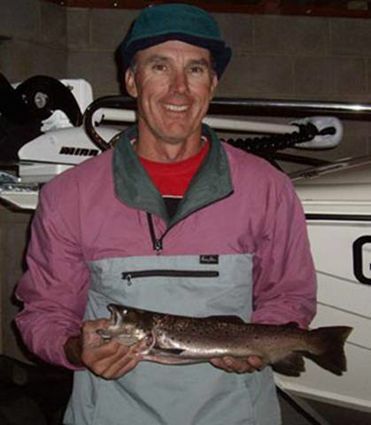 *An angler fishing Jindabyne went through 18 Mudeyes in a session this week on Atlantics, Rainbows and a solid 1.25kg Brook Trout. Al this between 9 and 11 am! Great fishing. I fished with two mates near seven gates last Friday night. We picked up 5 Rainbows between us and dropped another 3 or 4 fish. All were taken on powerbait. Pics attached.